No Pumps, Just Use Wind to Inflate! Blow up the pouch with air and instantly have a couch! 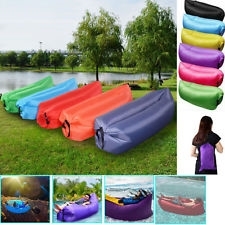 Pouch Inflatable Couch Air Sofa is the wind inflatable couch that's the perfect hangout lounge for indoor or outdoor activities. Use at the beach, park, pool, even in your home. 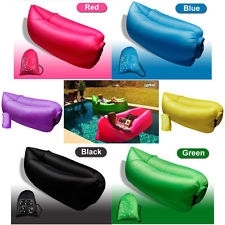 Simply inflate the pouch with wind and instantly you have a couch! Made of super durable nylon exterior, airtight plastic interior bladder, making this air sofa water resistant and long lasting. 73" x 29.5" x 20". Supports up to 375 lbs. Use at the pool, parks, camping, on the beach, anywhere! 73" x 29.5" x 20"